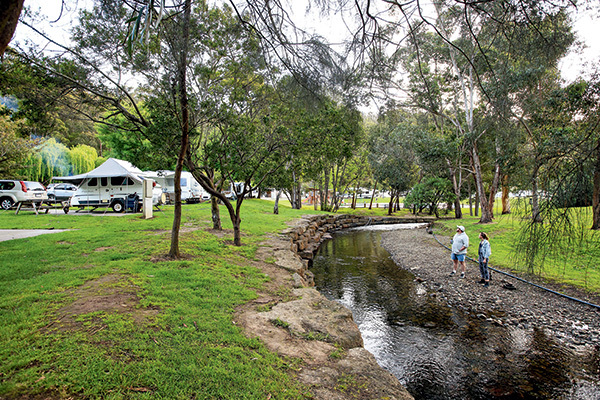 The friendly, picturesque Big4 Wye River Holiday Park in Wye River, Vic, played host to the large contingent of caravans and crew that arrived for the 2016 AL-KO Best Aussie Vans (BAV) awards. And our group – comprising Caravan World (CW) judges, photographers and videographers, and delegates for the 11 competing caravans – were greeted with open arms, lush green grass, beautiful grounds and typically Victorian weather – hailstorms and gale-force winds one minute, cloudless blue skies and bright sunshine 10 minutes later. With the competing vans dotted around the grassy park, nestled at the base of the surrounding hills and perched alongside the babbling river, the BAV crew was accommodated in the park’s many holiday units, and the large communal camp kitchen became our event HQ, easily large enough to host our group of 20-odd plus other campers that came and went. The Big4 Wye River Holiday Park is located on Victoria’s spectacular Great Ocean Road, between Lorne and Apollo Bay and about 2.5 hours from Melbourne via the coast. Set on 25 acres, Big4 Wye River has plenty of open space and holds up to 1000 guests. 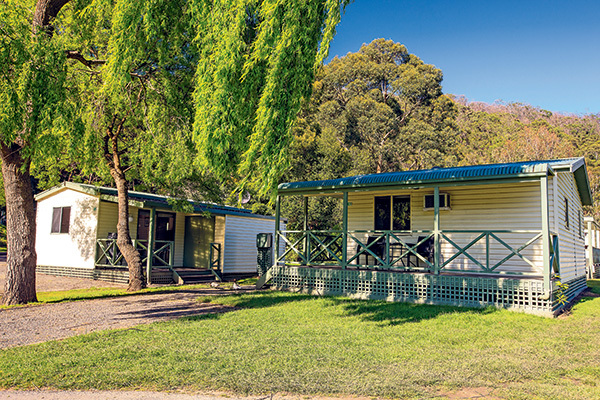 The park has several accommodation options including one-, two- and three-bedroom holiday units, which are all well-appointed and family-friendly. You can choose between more secluded locations or those directly opposite the children play area to keep a visual on the kids. There are large sites on lush green grass designated for caravan and camping, with many situated on the river’s edge. I’ll give credit where credit is due and the three amenity blocks, two of which are only a few years old, are pristine clean. I even heard one camper describe them as “five-star hotel bathrooms”. What’s more, all the shower recesses have designated screen doors – no flimsy plastic curtains here! 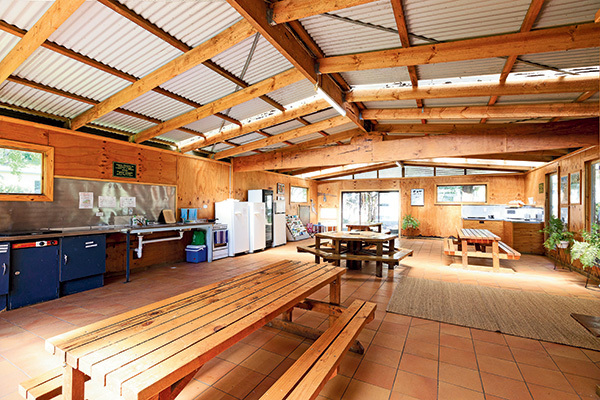 Laundry facilities and barbecues, along with the camp kitchen, are also available to guests. I experienced first-hand the great food and family-friendly atmosphere of the iconic Wye Beach Hotel, which overlooks the beach, and the Wye General Store and Cafe (the canapes are delectable). Both the hotel and general store are virtually at the entrance of the park and just a short walk away. There are endless places for kids to play within the park, which has the river meandering through its centre, and loads of space for bikes and scooters. I watched children climb the hills, and even build a rock bridge across the river. 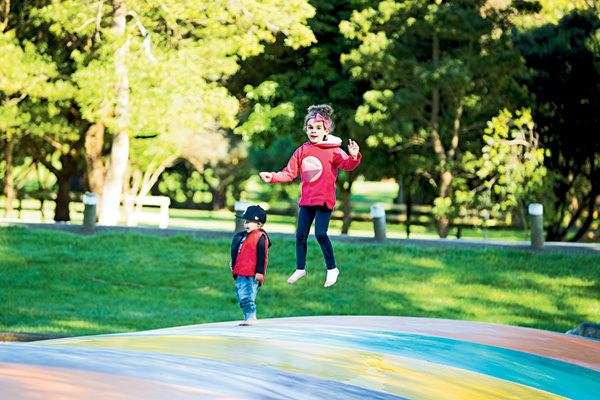 An adventure playground, games room, pedal go karts and a giant jumping pillow also kept the kids occupied. I was amazed by the myriad of wildlife I saw during my stay, including kangaroos and koalas which are frequently seen throughout the park – and we even saw a couple of echidnas. But even more wonderful was watching the vast array of birdlife, including king parrots, kookaburras, rosellas and cockatoos which populate the park. For the real bird enthusiast, countless more bird species can be spotted, including satin bowers and the rare ruphous bristle bird. 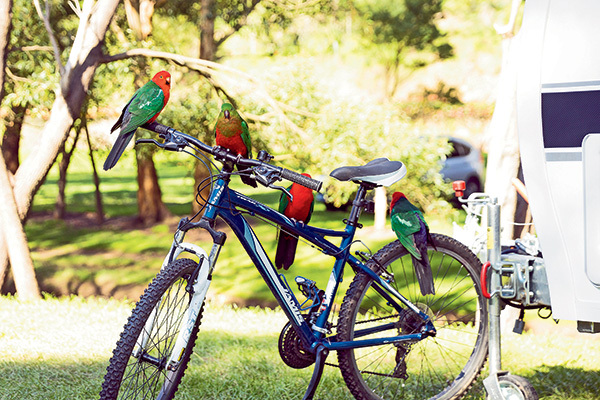 The park is in close proximity to some of Australia’s best mountain bike trails in the forest, walks and waterfalls, and fishing spots and surf breaks. 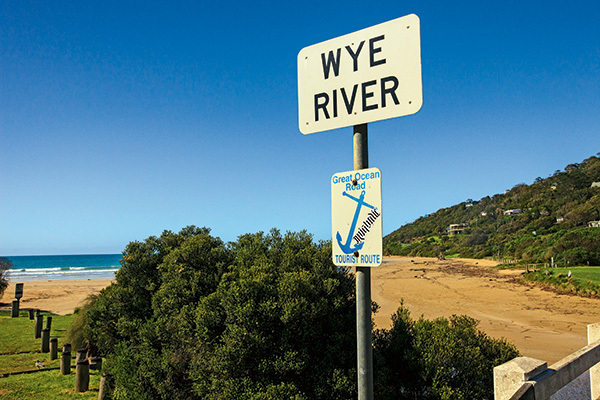 Back in 1882, Wye River was occupied by settlers – brothers Alex and Donald McCrae, who were looking for an area suited to farming and fishing and chose this site. They named their farm ‘The Wye’ after a river in Wales, UK. Now a popular seaside tourist town, Wye River’s off-peak population is around 150, but this number swells to over 4000 during the holiday seasons. 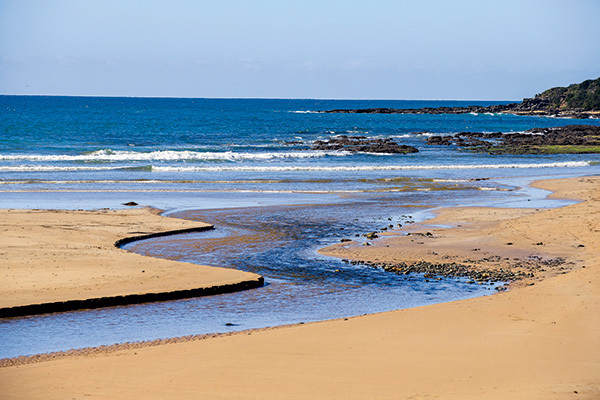 The tranquil coastal hamlet of Wye River is ideal for those seeking a sea change or tree change. But that sedate life was disrupted only a week before Christmas last year when a raging bushfire swept through Jamieson Creek before jumping containment lines due to burning embers and spreading to Separation Creek and Wye River. By the time it was extinguished, the ‘Wye River – Jamieson Track’ fire burned 2500ha of the Otway Ranges, destroying 98 homes in Wye River and 18 in Separation Creek. And then, in late September this year, flood damage causing landslides shut down the Great Ocean Road between Wye River and Apollo Bay. But all along, the stoic locals have stood firm, even though all-important tourism was severely affected during both these holiday periods. Wye River backs on to the Great Otway National Park and Otway Forest Park. Both parks are renowned for their ancient rainforests, steep forested ridges, deep valleys of tall forest, and fern-clad gullies leading to spectacular waterfalls. Wye River is ensconced in the East Otways (Torquay to Kennett River) and its rugged coastlines, dramatic cliff faces, sandy beaches and rock platforms. 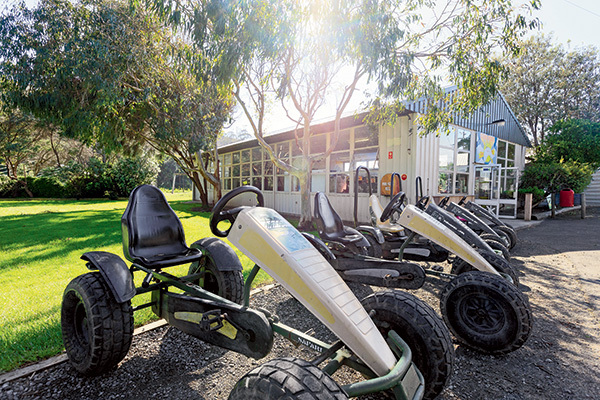 Visitors can enjoy a range of activities such as camping, fishing and hunting, wildlife watching, horse riding, bushwalking, mountain bike riding, car touring or 4WDing. And there are also many beautiful places to picnic including Blanket Leaf, Sheoak, Distillery Creek, Grey River and Moggs Creek. There are also a number of walks near Wye River such as Lower Kalimna Falls, a gentle walk follows the route of an old timber tramway with interpretative signs that help bring the history of the trail back to life; Ocean View, a pleasant forest walk offering spectacular coastal views and kangaroo sightings; and Cora Lynn, a gentle walk through lush fern gullies to stunning cascades framed amongst a backdrop of native ferns and mosses. 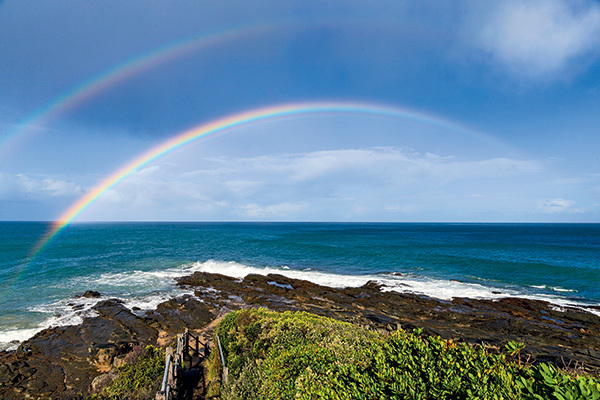 This area is also home to many spectacular waterfalls including Erskine, Kalimna, Phantom, Sheoak and Triplet falls, and several lookouts like Cape Patton, Castle Cove, Marriner’s (Apollo Bay), Teddy’s (Lorne) and Mt Defiance. From Melbourne, take the West Gate Freeway (M1) and then the Great Ocean Road (B100). Wye River (160km south-west of Melbourne) is situated between Lorne and Apollo Bay, along the Great Ocean Road. Otway Fly Treetop Adventures – a close up view of the rainforest from 25m above the ground. Cape Otway Lightstation, the oldest lighthouse on mainland Australia. Split Point Lighthouse for views of Aireys Inlet and a clifftop walk.